BEAUTIFUL BUNGALOW WITH SECONDARY SUITE AND AWESOME FOUR CAR GARAGE! Wow! 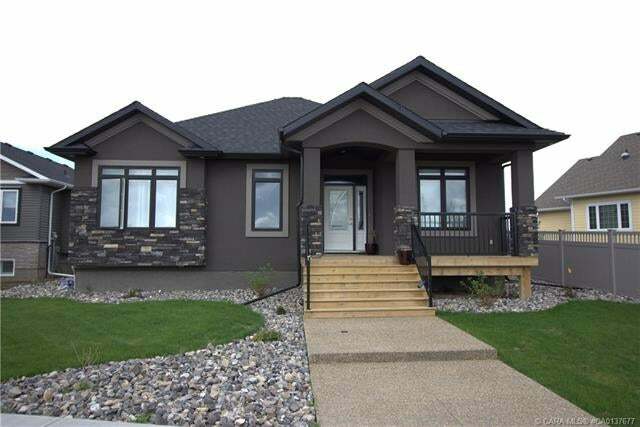 Located in the New Valleyview West Subdivision, Close to Parks and Walking Trails! Lots of Possibilities with the Perfect Hobby Shop and Revenue from your Secondary Suite! Main floor features a bright open floor plan, 9 Ceilings and hardwood/tile flooring. Excellent Kitchen with Island and WI Pantry. Superb Dinette with garden door to huge covered deck. Cozy gas FP in great room. Spacious Master with WI closet and Ensuite. Den, 2nd bedroom and MF Laundry. Private Entrance to basement Suite with cozy IN-FLOOR heating and 9 ceilings. Suite offers a large living room, lovely kitchen with island and WI pantry, 2 generous bedrooms, bathroom and a superb laundry area. Yard is very nicely landscaped with covered veranda, huge covered rear deck and a second deck for suite. Awesome 26/28x38 heated garage all finished! Huge RV and parking pad. Excellent Shop, Great Revenue and Beautifully Finished! Lot Size 0.23 Sq. Ft.